In spite of what you might have read on LetsRun, Edward Cheserek has nothing to be ashamed of. On Friday, Cheserek anchored the University of Oregon Ducks’s distance medley relay team to victory at the Penn Relays. In that race, he had faced a stern challenge from Villanova anchor Jordan Williamz. In the end, Cheserek bided his time waiting for Williamsz to make the first move. When Williamsz began his kick for home, Cheserek responded and surged past in the final 100 meters for the victory. It’s a tactic that has served Cheserek well in his short but spectacular NCAA career. In eight NCAA championship races over the past five seasons of cross country, indoor, and outdoor track, Cheserek has won six titles, and finished second twice. His signature move is a sudden, explosive acceleration late in the race, whether the pace has been fast or slow. It is a tactic that has helped him win titles in the Mile, 3000m, 5000m, 10,000m, and cross country. On Saturday, Cheserek and Williamsz faced each other again in the much-anticipated 4 x Mile relay. On paper, Oregon appeared virtually unbeatable. The Ducks had shown incredible distance depth indoors, with three runners making the NCAA final in the mile. Furthermore, they had the NCAA indoor champion — the best collegiate runner in the country — running the anchor leg. It would seem that if Cheserek got the baton anywhere near the lead, the race would be over. Through the first three legs, the race played out as expected with Oregon and Villanova sharing the lead. At the final hand-off, the time was 12:04, meaning that the first three runners from each team had averaged just over 4:01 per mile. With 3:56 miler Cheserek on anchor, could the Ducks do what no collegiate team had ever done and go sub-16:00? 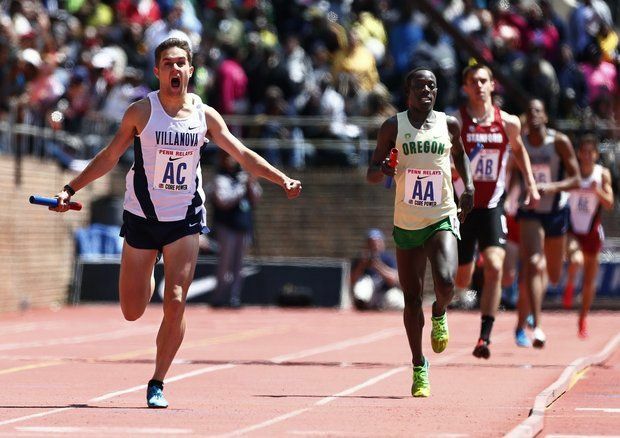 Could Villanova keep it close before the inevitable Cheserek kick settled matters? But almost immediately, the race turned hyper-tactical. Taking the baton for Villanova, Williamsz immediately yielded the lead to Cheserek, and settled in directly behind him. Cheserek, having no desire to lead for four laps on a windy day, slowed down. Within only a few strides, every spectator knew that hopes for a record were in vain, and that this was going to be a sit-and-kick race. With the crowd whistling and booing, Cheserek did everything he could to entice Williamsz to take the lead. He (Cheserek) pulled out into lane 2, slowed to a near-jog, but still Williamsz refused the gambit. Meanwhile, with the pace so slow, most of the other teams caught up to the leaders until there was a huge pack of runners stumbling over each other to establish position for the inevitable sprint that was to come. The leaders first lap was ~65 seconds, their second lap ~68 seconds. For many, it was shocking to see them running so slowly, especially after the first three runners had battled so hard to bring the baton around quickly. When the kicking did finally commence, Cheserek made his move, but this time Williamsz got the better of him, sling-shotting around the final curve and into the lead. Williams ran his final 400 in ~51 seconds, and his final 200 in just over 23 seconds. Not even Cheserek, the King of the distance kick, could match that. Almost as soon as the race was over, LetsRun exploded with criticism for Cheserek and Oregon. Anonymous posters to the LetsRun message boards wrote that Cheserek should be ashamed, that he had blindly followed a bankrupt strategy by slowing down so much, and that he had thrown away what should have been an easy win by refusing to run an honest final leg. They implied that he was lazy, naive, and incapable of reacting to a race situation that didn’t fit his preconceived race plans. Basically, they had a hard time accepting that he and Oregon could lose. Visceral reactions aside, I don’t believe that Cheserek deserves such criticism. That he is lazy is a laughable conceit. No runner has run more championship races or had so much success over the past two years as Ches. That he made a grave tactical error is at least debatable, as I’ll try to show. That he squandered a chance for Oregon to set a Penn Relays record likely ignores the fact that the Ducks were in the race to win it, and a record was at best a secondary concern. I believe that the bizarre final leg, and Villanova’s upset victory, resulted from the leader’s dilemma, a tactical challenge familiar even to high school runners. The leader’s dilemma occurs when two fairly evenly-matched runners compete, and one of them has better top-end speed. Because following uses significantly less energy than leading, the runner with the better speed has no incentive to take the lead until the very end, where a superior sprint wins the race almost every time. Now, it might seem strange to accept the two premises that a) Williamsz and Cheserek are “evenly matched” in a mile and b) that Williamsz has better top-end speed, but let’s consider the evidence. We know that Cheserek can run a mile in 3:56-something; he ran that time indoors this winter. We know that he is the NCAA champion, having defeated Christian Soratos in a remarkable race in which Soratos himself faced the leader’s dilemma and tried to run the middle of the race so hard that not even Cheserek would go with him. Ches stayed right behind a desperate Soratos through an insanely fast mid-race surge, and out-kicked him in the end. What about Williamsz? We know that Williams can run a mile in 3:59-something (his time at Princeton a couple of weeks ago), and that he can run 800m in 1:46.7, which is likely faster than Cheserek could run, although I don’t think Ches has run an 800 since high school. (At 3K and up, Ches is the far-more accomplished runner — it’s not even a contest — but at a mile, Williamsz is within a few seconds, and there’s good reason to suspect he has superior top-end speed). While it is notoriously difficult to measure precisely the benefit of “drafting,” the accepted science suggests that on a still day, running at a pace typical of an international mile (e.g., 15 mph or 60s per lap), drafting is perhaps a second per lap “easier” than leading. That suggests that over a full mile, drafting offers a 4-second advantage over leading. Presumably, that advantage grows when conditions are windy, as they were in Philadelphia on Saturday. So had Cheserek run a hard, even pace from the gun, and Williamsz had held his place in the Oregon runner’s slipstream, Cheserek’s advantage based on his best mile time would have been negated. Instead, Cheserek slowed the pace in an effort to have Williams at least share the lead. Not only did Williamsz not take the bait, but when other teams caught up, for the most part, they didn’t take the bait either. The laughably slow pace was a collective decision. The result was that Williamsz never had to lead, and had only to keep himself in position and out of trouble for the final kick. What could Cheserek, the leader, do? In hindsight, he might have tried multiple surges to try to open a gap on Williamsz, or gone very hard for the first 400m, but the success of these tactics would depend very much on how Williamsz responded. Running hard from the exchange might have been the best strategy, but even then there would have been no guarantee of success. One thinks of other classic races where the leader was run down in the end by another runner with a better finish. Banniser-Landy in the Empire Games. Bekele-Tadesse in the 2009 world championships. And one remembers races where the leader “gets away” — Keino-Ryun in the 1968 Olympics — opening a big enough gap that the advantage of following evaporates. The point is, getting away is hard, hard work and can never be taken for granted. Cheserek didn’t lose the race by slowing down, but he did pass up the opportunity to dictate the terms of the contest. Maybe in the end that’s why LetsRun posters were tearing their hair out. Cheserek could have forced the race to be a test of strength, but he let it be a test of speed and tactics. And this time, at least, Williamsz played his hand better and won. This entry was posted in Pro Runners, Racing and tagged Leader's Dilemma, Penn Relays. Bookmark the permalink. Williamsz didn’t yield the lead, he started behind Cheserek and merely didn’t seize the lead. Cheserek is the one who “yielded” the lead when he made the slow down. While I understand leader’s dilemma, I believe that Cheserek, as the stronger runner with better PBs at the mile and above, should have maintained the lead for an honest race to occur. Cheserek doesn’t prefer honest, Prefontaine like races, he likes the tactical races where he can not only use his kick strength- as most good milers do in the last lap anyways- but so he can use his short speed off of a slow pace. Is a so-called honest race what should occur all the time? Maybe, maybe not. You can argue that a tactical race generate fandom, yet fans booed at the slow pace at Penn. Perhaps that’s just because it was too extreme, as Drake certainly was a slow race (for those guys) but was exciting to watch. In this case, an honest race was already under way, as the first three legs of every relay team ran hard legs. Cheserek had the ball in his court, and chose to go super-tactical. Talking about the ethics of the sport, not just the tactics of the race, I’d say he made a bad choice. Thanks for the comment, TS. I appreciate you taking the time to write! Interesting that you invoke Prefontaine. I’ll grant you that Cheserek’s racing style hardly resembles Prefontaine’s, but then how about Williamsz? Is drafting for 7/8th of the race so that you can use your superior 200 speed a Prefontaine-like strategy? Also, I think the use of the word “honest” is problematic. We use it in racing to describe a pace that roughly aligns with a pace we can run for the entire distance. But I think you go too far when you make the leap from “honest” in that sense, to “ethical.” I find nothing unethical in Cheserek’s choices. It might be frustrating to spectators, but tactical (slow) races are a part of the sport, and a challenge to any runner who relies on strength rather than a fast finish. This tension exists at all levels of racing. My friend Josh reminded me that the Penn relays record was set by a Michigan team that put the great Nick Willis on the THIRD leg, where he opened up a 100m lead on the field. That eliminated the possibility of a tactical anchor leg. Maybe Oregon should have done something similar, putting Cheserek second or third and telling him to get as much of a lead for his team as possible. Maybe that would have been better tactics for an Oregon team that appeared to be head and shoulders better than all the other schools. Williamsz can run about a 3:59 mile? I think his recent 3:39 1500 deserves a more generous conversion to about 3:56 for a full mile. Also, the guy ran 3:36 behind Kyle Merber GOING INTO college. He is very close if not superior to anyone in the NCAA over the mile when he’s on his game and it looks like that might be the case this year. Been back reading the blog for a couple months. Really enjoy your writing and viewpoints. Heady stuff to be mentioned and linked on letsrun. Welcome back, Mike! Thank you for always having supportive things to say about my writing. I’m really glad you are enjoying the blog! I do feel like I’m having my 15 minutes of fame, here. If I’d known Letsrun would have picked it up, I think I would have spent a little more time polishing the post, but oh well. I wonder if LetsRunners will stick around to read about Battle Road and the bittersweet but very real pleasures of being an aging runner. Good luck to you and Brookline (and Needham) the rest of the season.